Or she’s part of the reason why. I’ve drawn a lot of flak on this and why I draw flak on it, has always been a mystery to me. Whether or not any drug should be legal, is a question on which the federal government has no jurisdiction whatsoever. Congress can declare things illegal, but only after it has been granted the authority to declare them illegal. Congress receives the authority it has through the Constitution and amendments to that document, and by no other means. It cannot grant this power to itself, nor can it be conferred upon the legislative branch by the other two. If there’s a Supreme Court decision that says otherwise, it is quite simply wrong. Making a drug illegal is a states’-rights issue. It would be better to legislate such a matter at the county level than at the state level. It would be even better to decide it in a township. Best of all, make it a homeowners’-association clause. The idea of one man, pointing at another man across the miles, lakes, fruited planes, degrees of longitude, into some locality he will never visit, and declaring what the other man may not consume, just repels me. It’s not just a constitutional question, it’s a question of sound law enforcement. People have a right to decide how they’re going to live, and that means the local community has to reign supreme. People in Oregon have a right not to have their votes on such questions watered-down by people in California. People in Davis have a right not to have their votes on such questions watered-down by people in Folsom. But — and here’s where I take the flak — in my corner, I’m voting no. Don’t legalize. We do not need more of what this does. We do not need more Carrie Fishers. They just aren’t that special. I have made occasional reference to the fact that I grew up in a college town. In truth, I had a little bit closer contact with the spoiled-rotten, tweaker, can’t-think-straight, long-hair maggot-infested Ozzy Osborne wannabe kids than that. The college campus was at midpoint between home and my middle school. My friends tended to be older, and in junior and senior years I visited them in their dorms. I did volunteer work for & with them. One of the more educational stints involved working as a disc jockey at their radio station. At the time, you could qualify for a Class D radio operator license at age thirteen, and so I did. This involved occasionally sitting in after-hours with the Program Coordinator and other artistes to plan out what we were going to do. From these and other experiences, what do I know? I am certainly not ordinary. I think it’s been hard for my daughter. I know it’s not easy for her to have a mother who is bipolar and had a drug problem. My father had a drug problem. That stuff’s tough. It makes you grow up too fast. My daughter has had to be very strong to overcome some of my challenges and she is. It’s hard to freak me out. I’ve had a lot of extreme experiences in my life. She’s fifty-three and still talking like this. It is never stated outright, but you are supposed to infer that these “extreme experiences” that make it “hard to freak me out” and “[make] you grow up too fast” — there is something glamorous about them. These tragedies in the formative years give the speaker certain bragging rights. In spite of what has been screwed up as a direct result, these things are assets. They are recollected that way, treated that way. In Fisher’s case, she’s passing it on down to the next generation. Oh look, I handed this bag of crap to my daughter; she shouldn’t have had to deal with it, but look how strong she is as a result. Well now. There certainly is something to this, I’ll admit. Or rather, there could be. “Hard to freak me out” can be an advantageous quality. Trouble is, in order to gain a win from that, you have to translate it into Kipling’s “If you can keep your head when all about you are losing theirs and blaming it on you”. In other words, low-drama. Failing that, there’s no gain from this. These people are not low-drama. Not even close. In fact, the net loss is rather profound because this business of “I’m just so jaded” leads, rather directly, to an inability to discern. And their judgment is seduced. Look no further than the interview I’ve already linked, for a glorious example of this. Is there anyone you haven’t met that you’ve always wanted to? I’m surprised you haven’t met him. I know. I love him. Hopefully I’ll meet him sometime. I’m just happy he exists. Do you think Tea Party is just people who are pissed that there is an African American president? Okay, in an ideological sense I disagree with this and if you are familiar with some of my past comments, it would be redundant for me to explain why. Fisher got some facts grossly wrong about the Tea Party movement, and even if you lack sympathy with it, they’re probably easy to spot so I won’t point ’em out. As I said, these jaded-druggie-rock-n-roll kids suffer a weakness in discernment. This is my critique about those final paragraphs in the interview. By now, it’s hardly news to anyone that Barack Obama is a rather ordinary politician. Agree with His policies if you like, but you haven’t heard any talk about “He’s Sort Of God” lately and there are a lot of reasons for that. He’s an excellent speaker, a kind of mediocre politician, a poor executive and — well, how I rank him against the other presidents is not germane to my point. I’m sure Fisher would rank Him differently from the way I would, and I cannot fault her just for this. Life would be boring if we all agreed on everything. I do fault her for being in love with someone she’s never met. You’re seeing a manifestation of what all those lectures from your parents, maybe from your high school health class, from your gym teacher, were about. 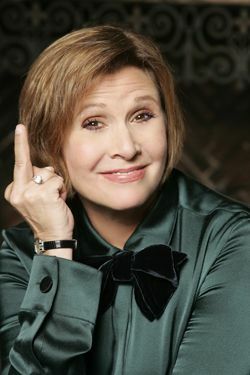 Carrie Fisher cannot think straight. She is damaged goods. She is a walking incarnation of the reason I would vote to keep drugs illegal. These people have “been through a lot”; they think they’re special because of this, and they’re wrong. They’re rather humdrum. Their ranks are swollen and they are common. I can write their little “been through a whole lot” speeches, for them, with blistering accuracy, entire phrases at a time. Because that’s how they talk, in cliches. Each one speaks as if he or she is the first to go through this, when it isn’t true. This is the great tragedy. This is why they think they’re special when they aren’t really special. And this discolors the lens through which they view all others. They seem to show great reliability in seeing extraordinary things as ordinary things, and — more often than that, perhaps — ordinary things as extraordinary things. They do the greatest damage when they see healthy things as unhealthy things and vice-versa. Their solutions to problems are the exact opposite of what common sense would offer. I don’t know if this can be completely explained by what follows, but I’m settled on the idea that this is, at least partly, because they perceive the components of the problem as more-or-less the opposite of what they really are. See what these plans all have in common? This coveted resource which is oil, and all products that are derived from it, which includes energy — is to be made more scarce. So these people want to run everything. And they’ve lost touch with reality to such a great extent that they cannot even maintain a working comprehension of the basic laws of supply and demand. Also, the non-productive are treated as if they are productive. And, again, vice-versa. Yes, lawyers make big heaping truckloads of moolah. It’s never failed to amaze me how, when it’s time to toss up the evil-awful-greedy-rich-people on the giant display screen for the two-minute-hate, it’s always supposed to be some kind of a “hedge fund manager,” maybe a CEO who started his company by building a real thing that helped real people…and not a lawyer. Little bit of a side-trail here: Isn’t it rather breathtaking the free ride lawyers get? It’s gotten to the point that there are two things in this whole freakin’ country: Things that work the way lawyers say they should work, and things that will work that way someday soon as they get around to it. But for all our various problems we’re supposed to blame all these other rich people. They will object most vociferously to the criticism that sticks the best: They are malleable. It is easy to sell them things if you just push the right buttons. These people are so jaded, their gears are so stripped, they’ve grown up so fast and it’s so hard to freak them out…that it becomes quite a simple matter to tell ’em what to think, and they don’t even know it. They can be told who to hate, and they’ll follow right along. They lie to themselves, so what they say to others cannot be trusted. They all seem to have it in common that they are, ostensibly, in search of a life they can live out in peace, free of interference from others. This is absolutely, positively, not what they want. They want everyone living, of whom they will ever gain a working knowledge, to be tethered to a yoke and then they want to have control over that yoke; or someone they “love” to have control over that yoke. They want the commoners to be controlled, and they want a special, non-universal, exclusive, elite class to do the controlling. They’re in favor of democracy, of course — but only if & when the correct side wins. Otherwise, someone must have tampered with the ballot boxes. They’re fair-weather friends to democracy. They want laws that help “everyone,” laws that “everyone” likes especially if there is some part of the “everyone” that actually is hurt by the laws, and hate them. They like the laws even better, then. They want laws that cause injury to some of us, and then they want to make sure everyone who disagrees cannot have any voice in the process. What they really want is slavery. This is why they go through this business of ostracizing the dissenters, slandering them, gutterballing them. And now, if you have some beef with the unprecedented Obama deficits and you’re worried that your kids & grandkids won’t be able to keep any of their paychecks, you oughtta be joining the Ku Klux Klan. Nice one, Carrie. We just don’t need any more people acting this way. We don’t need more people thinking this way. We have more than enough already. Case closed.